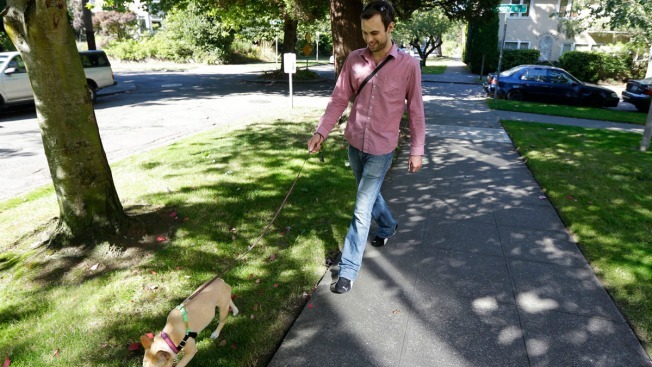 Aaron Brethorst walks his dog, Moxie, in Seattle on Monday, Sept. 9, 2013. Brethorst says he doesn't have a problem with President Obama's health care reforms because he figures he'll be able to afford quality insurance and he expects his coverage will be even better once the Affordable Care Act kicks in. President Obama's health care reforms will be a huge boost to the working poor but are likely to make life more expensive for Aaron Brethorst and others like him. The Seattle software developer and consultant doesn't have a problem with that because he figures he'll be able to afford quality insurance. He says his annual income is in the low six-figures, and he expects to receive better coverage once the Affordable Care Act kicks in. The 31-year-old says the ability to buy his own health insurance, because he is relatively young and healthy, has given him the creative freedom to start his own companies and explore new ideas. He spends a little more than $300 a month on catastrophic coverage with a high deductible. He recently got an email from his health insurance company informing him that the plan he bought on the individual market is going to be cancelled. Brethorst said he does not know whether he will buy his next policy from the same company — a local version of Blue Cross — or through the state insurance exchange, the Washington HealthPlan finder. He does expect to add a better dental and vision plan in the new year, however. "I'm not worried about it, quite frankly," Brethorst said. "My income today is more than enough to pay for health insurance." That outlook is not likely to be universal among those who are self-employed. The income threshold for a government subsidy offered on the state exchanges varies based on a number of factors, but generally tops out at $46,000 a year for an individual. Depending on their health, age, family circumstances and income, the cost of insurance could become a burden for those who make too much money for government subsidies but not enough to be considered well-off. Insurance companies say the cost of their polices will have to reflect the new government mandates under the Affordable Care Act, including the requirement to cover all people, regardless of their medical condition, and to provide coverage for 10 new essential benefits that include mental health treatment and maternity care. Glen Melnick, a health economist at the University of Southern California, said he believes many younger singles who are self-employed will decide against buying health insurance despite the government mandate, opting instead to pay the fine. "They're going to decide not to play. They are risk-takers to begin with," he said. Yet the additional benefits under the law could outweigh the added costs for some, said Dylan Roby, assistant professor and researcher at the University of California, Los Angeles Center for Health Policy Research. Another positive of the federal reforms is the ability to more easily comparison-shop between insurance companies and policies, he said. Brethorst said the Affordable Care Act is likely to provide freedom to those who currently cannot afford to escape employer-based coverage to pursue their own dreams. The iPhone app developer and business consultant cites as an example a friend and colleague with asthma. They started a new company together a few years ago while his friend was buying his insurance from a former employer through the federal COBRA plan. When the venture capital funding they were seeking fell through before his access to company health insurance ran out, Brethorst's friend left for another company job where he could get health insurance as an employee. "We've been talking about working together again at some point," Brethorst said. "Once these provisions go into effect, it's going to be significantly easier to go off and pursue his entrepreneurial dreams."